IBM® WebSphere® Process Server is a business integration server that was built to support solutions that are based on the service-oriented architecture (SOA). It plays a key role in the architecture of the IBM SOA Foundation by providing functionality for process services. Another key component of the architecture is the enterprise service bus (ESB). IBM provides three key ESB products: IBM WebSphere Enterprise Service Bus, WebSphere Message Broker, and the WebSphere DataPower Integration Appliance XI50. This IBM Redbooks® publication has been written for architects who are planning an SOA solution and application designers who are implementing an SOA solution with WebSphere Process Server and WebSphere Message Broker. 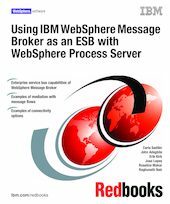 In this book, we highlight the ESB capabilities of WebSphere Message Broker and explain how you can leverage them with WebSphere Process Server. In addition, we discuss interoperability and provide examples to illustrate the integration of the two products.